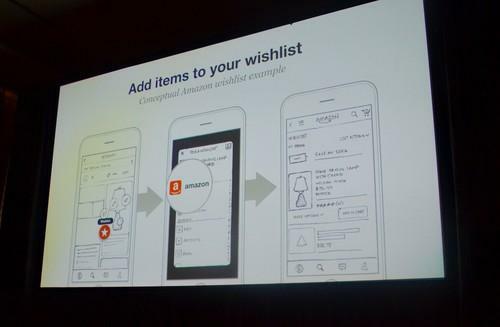 A Pinterest slide at a conference held in San Francisco on June 1, 2015, showed, hypothetically, how Amazon might incorporate its Wish List function into Pinterest. When you search for a recipe on Pinterest, the results soon might include a way to have the ingredients delivered to your door within 45 minutes. That's not a function built into Pinterest yet, but it could arrive in the future as the company grows its new platform for third-party developers. That platform, announced last month, is designed to let outside developers incorporate their own apps and services into Pinterest's site to expand how the site can be used. Content on Pinterest is organized into visual bookmarks, or "pins." Outside partners, such as advertisers, already work with Pinterest to incorporate content like images and product information into their pins. The new developer platform would allow select third parties to integrate services and do it on their own, without Pinterest's help. Many people already use Pinterest to find recipes. In the aforementioned example, the app for FreshDirect, a food delivery service, would be included in the pin for the recipe so that the ingredients listed can be delivered to the user, said Tim Kendall, head of partner products at Pinterest. "We want this to be all over Pinterest," he said Monday during a talk at EmTech Digital, a conference in San Francisco held by the publication MIT Technology Review. Kendall stressed that the integration was just a hypothetical example of how the developer platform might be used. Another hypothetical example he gave involved Amazon as the developer partner: Say a Pinterest user searches for a lamp on the site. The pin result for the lamp might include a way to add the lamp to the user's Amazon Wish List, Kendall said. Pinterest's developer platform is not designed as an advertising measurement tool. But an integration like the Amazon example might help an advertiser on Pinterest, in this case Amazon, more clearly assess whether their ads on Pinterest led to sales. Pinterest has gradually scaled out its advertising over the past year. The site calls content from paying advertisers "promoted pins."